O'Ring & Engineered Seals Division - Les Joints Étanches R.B. 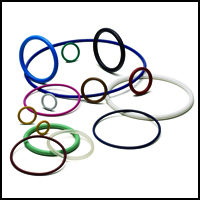 Inc.
O'Ring & Engineered Seals Division designs and manufactures homogenous rubber, rubber-to-metal and rubber-to- plastic retained seals. O'Ring Division specializes in innovative polymeric sealing systems – over-molded technology and the integration of multiple components into unitized assemblies.